Completely floored by the almost surreal landscape on display, some mild sleuthing told me this was taken at Hotel Edelweiss, in Murren, Switzerland. 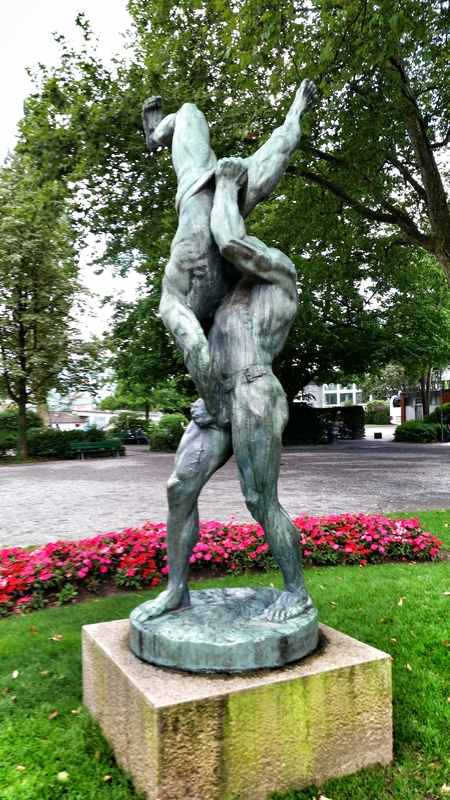 Quite honestly, I only knew Switzerland as a major banking hub, and had no idea it was known for its incredible scenery. At that moment, we decided that this country is where we wanted to spend our anniversary, on this – our first trip to Europe. I also made it a goal to sit at this exact same table during our journey. I mean, this picture was the whole reason for the trip to begin with, so why not insert myself into the scene, sans-photoshop? Trains in Switzerland are dead silent. I don’t mean the train itself, which actually was pretty quiet, but nobody was talking! 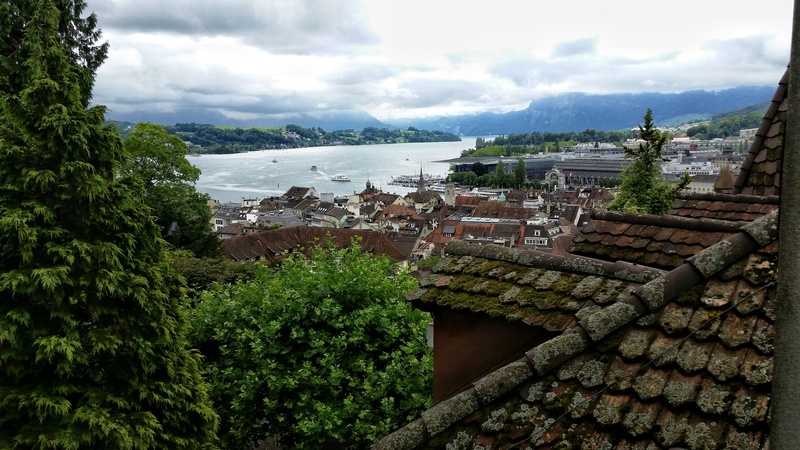 We kind of quietly whispered to one another on the journey, wondering if we were breaking some Swiss taboo by talking on a train, but more than likely it was because it was a Monday morning at 6:30 AM and full of exhausted commuters on the way to work. Weather in mountainous regions is unpredictable. Awful weather was in the forecast for us, but it couldn’t have been a more sunny, pleasant day. 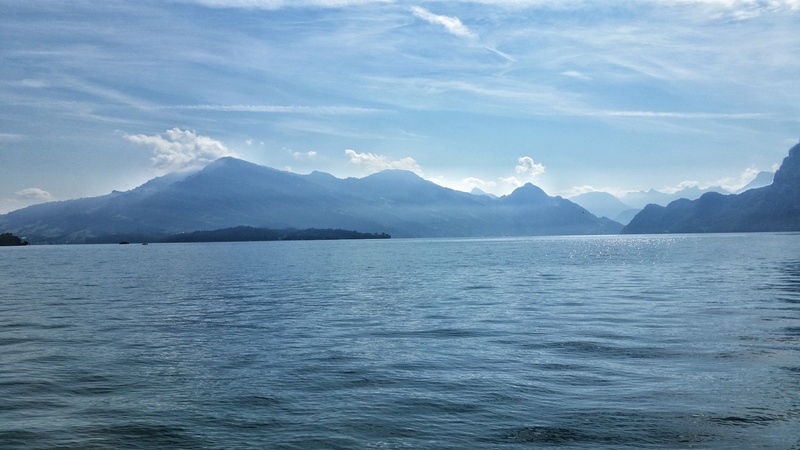 With the good fortune on the weather-front, we decided to immediately take advantage while it lasted and take the ferry across Lake Lucerne toward Mount Pilatus. This was originally planned for the following day, but hey – we were jetlagged, and figured the mountain air and sunshine would do us good. We attempted to stay up until a normal local bedtime, but by 5:30 PM, we had already been awake for something like 30 hours, and my bloodshot eyes would barely stay open, so we decided to call it a day. We stayed at the Hotel Cascada, a really charming, small boutique hotel in a great location very near the train station, and within easy walking distance of the old town and the major sights. 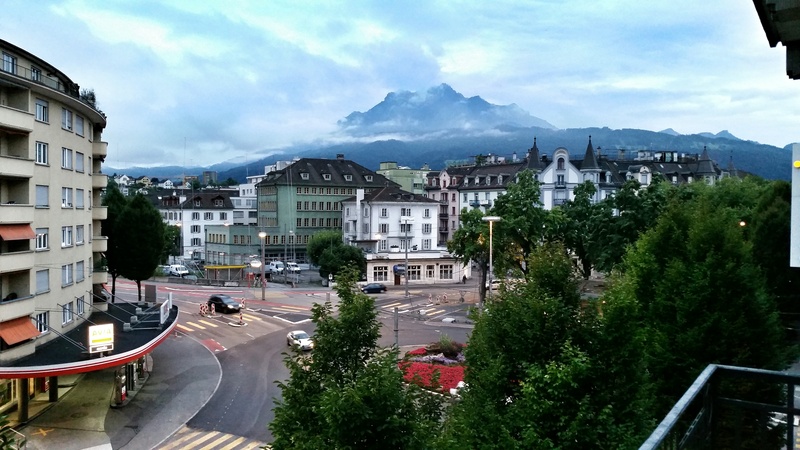 The view from our room of Mount Rigi was a nice touch. Cake or death? Um, cake, please! The view over the city from the city wall was specatcular! 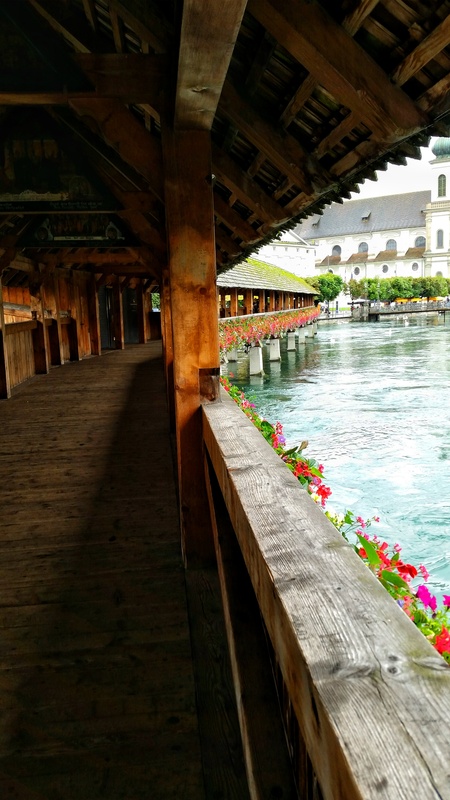 Lucerne was a great introduction to the country for us. The 2 days were perfect – any more would have probably been to much. 1 day to explore the mountains, a second day to explore the city, then on to new adventures. Following a nice breakfast at Hotel Cascada on day 3, we headed to the train station to depart for St. Moritz. Could you tell me what time in July you visited Switzerland ? Loved the sunshine in your pictures. Wondering if we should plan late July or early July or early August :). Hey Krishna, We were there in late July and into early August. The weather in the mountains is so variable though – we had many sunny days, but a few rainy days mixed in as well. Just a matter of luck being on your side! Planning for a trip to Switzerland. Great info! Great information, I’ll be visiting there switzerland in next week.Thank you Justin for preparing me in advance. Glad I could help! Hope you enjoyed your trip! Hi Justin and Christina, Thanks for sharing your travel experience. I really like your blog and it is very informative and useful for people to plan the trips. I hope you can continue your travel and share more great blogs. 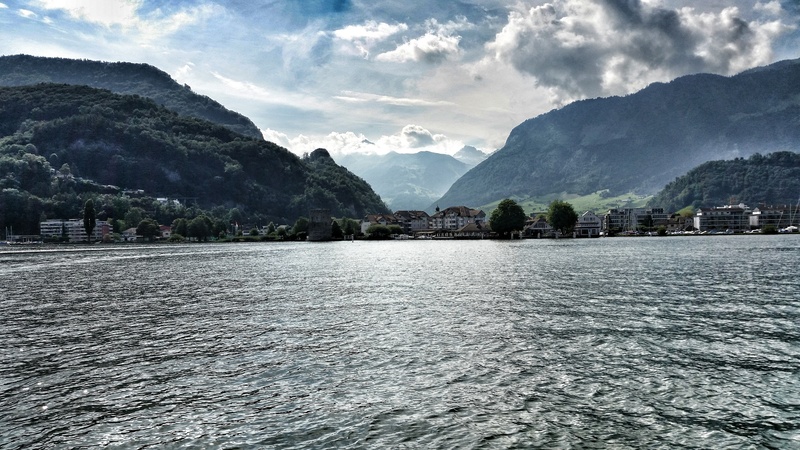 Your first picture after arriving in Switzerland looks amazing, and it is just like a background image. Kudos! 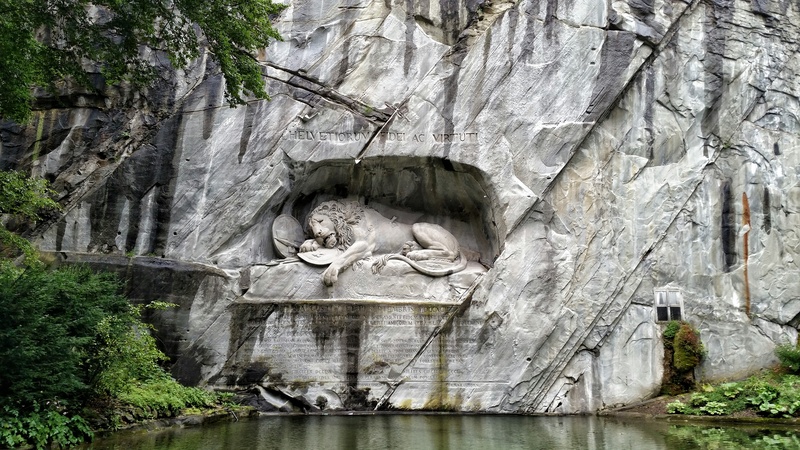 I am doing some research about Lucerne, and it will be part of my trip in Switzerland as well, just wonder if you can check this itinerary and let me know what you think? Does it cover most of the attractions? or I should find something else. Thanks! Thanks so much for stopping by! 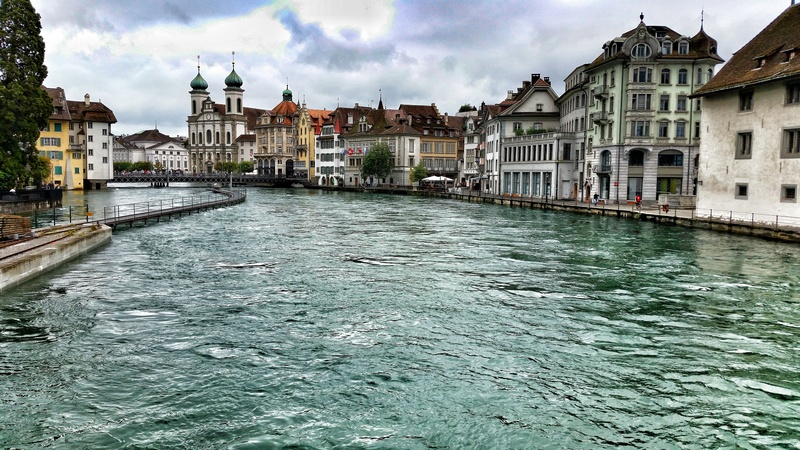 You will fall in love with Lucerne – the itinerary you linked will be quite easy to get through. The town itself is quite compact and easily walkable. Enjoy your visit and happy travels! wow the images of the water and mountains is amazing I cant wait to go there again and enjoy the beautiful sites again. Amazing blog and brilliant snaps. lot of life in both. You motivated me to to Lucerene in May this year. 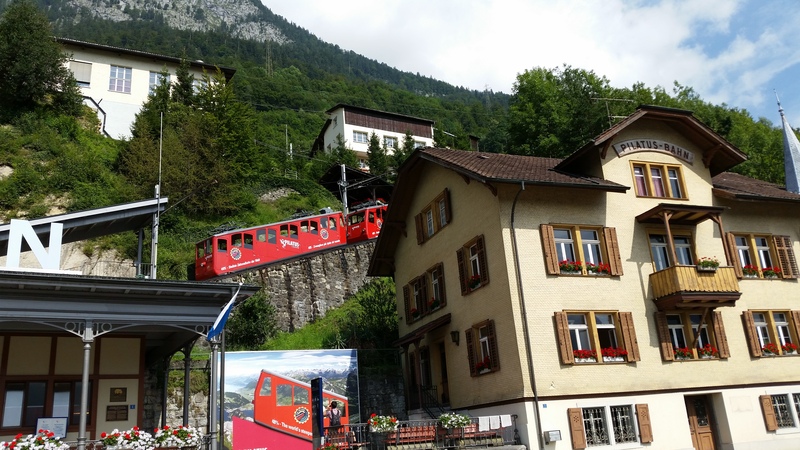 Just wondering what would you choose between Mount Titlis, Rege, and Pilatus? Would you advise to visit one, two or all the three. My constraint is time and do not have more than 2 days for Lucerene. Another query is the type of Camera and the lens you have used to capture those amazing snaps. Appreciate if you could give some info on that too. Did you ever find the place in the picture with the beers and the mountain range? I’m heading to Switzerland in April and I would love to visit that spot! Yes! 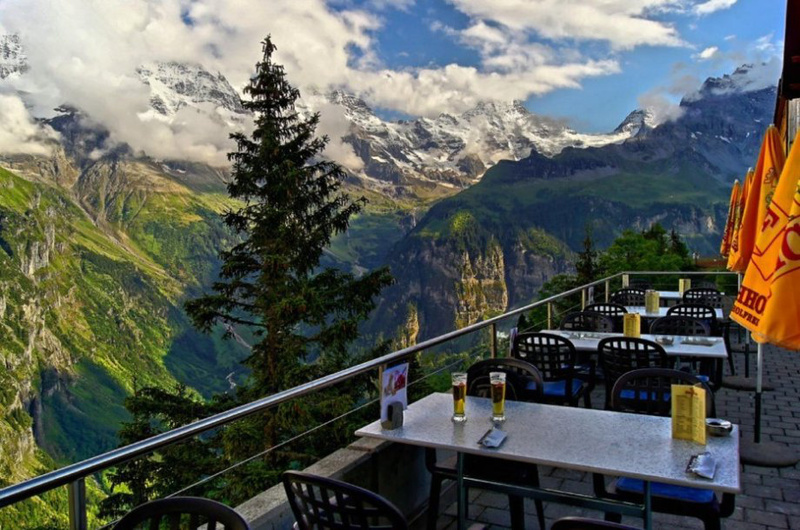 It was at the outdoor terrace of the restaurant at Hotel Edelweiss in Murren. Great food, even better views! Switzerland is so rich in natural beauties and the scenery there is truly surreal, Justin! We’ve been there last year on our European road trip and the beauty of Switzerland left us speechless. Your pictures are proof of how remarkable this country is! Agreed! The beauty of the mountains is unparalleled by anywhere else I’ve visited! We are just back from 7 days of Saas Fee in Switzerland, it was amazing. 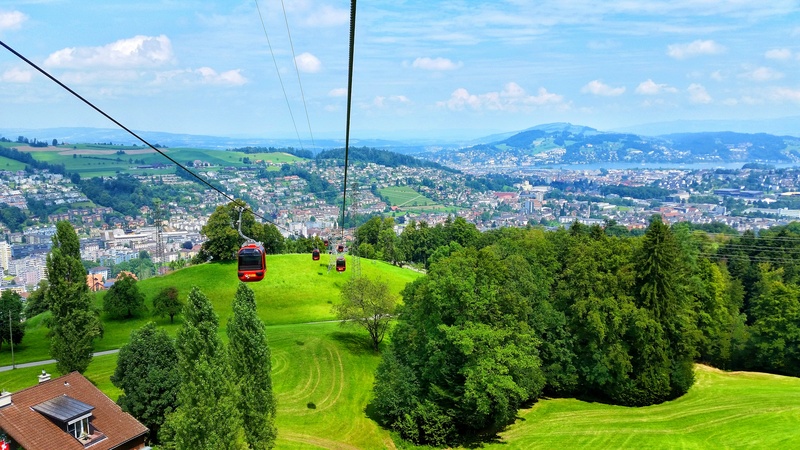 But from reading your post, we need a lot more time cause Switzerland has so mich to offer. Lucerne looks great! Thanks for the info and article. 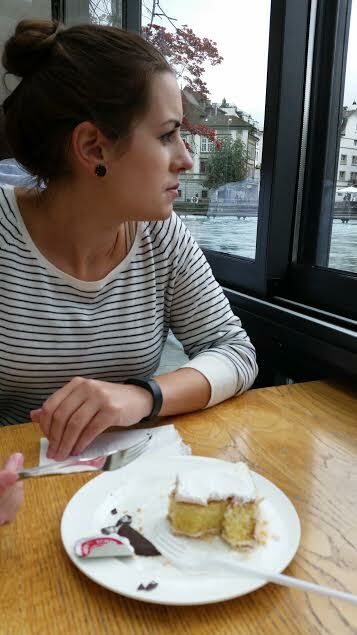 Could you share which bakery / name of the cake it was with soaked alcohol please? I’m intrigued!